The structure is designed specifically for the funeral rites for a king, based on ancient royal traditions. Standing at 53 metres high, the edifice sits on a three-tiered, square shaped base with a staircase on each of the four sides, each side measuring 60 metres wide. The royal crematorium comprises of nine structures designed in the style of Busabok, an elaborate pavilion throne tapering up from the base into an ornately decorated tiered roof topped by a spire. Of the nine Busabok, the principal Busabok sitting on the top tier of the royal crematorium's base has a seven-tiered, spired roof, housing Phra Chittakathan, the catafalque for enshrining the royal urn made of sandalwood. Each of the four corners on the top tier of the royal crematorium's base is also placed with a smaller Busabok called Sang, a monk's pavilion with five-tiered roof, for monks to sit and prayer. The remaining four Busabok are located at each of the four corners on the second layer of the royal crematorium's base, bringing all the number of Busabok structures to nine. 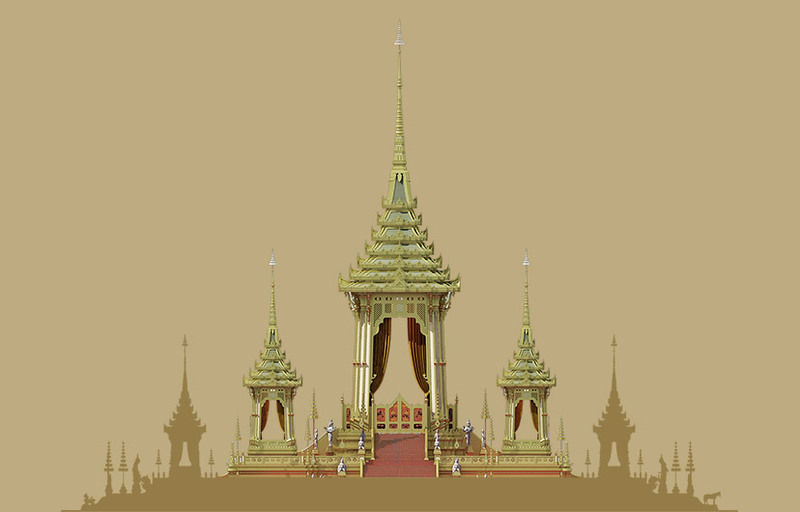 Phra Chittakathan is a royal catafalque for the royal cremation, with a square-shaped plinth for cremation. Phra Chittakathan is often decorated with coloured paper and fresh decorations such as flowers, banana leaves, carved banana stalks, and carved fruits. 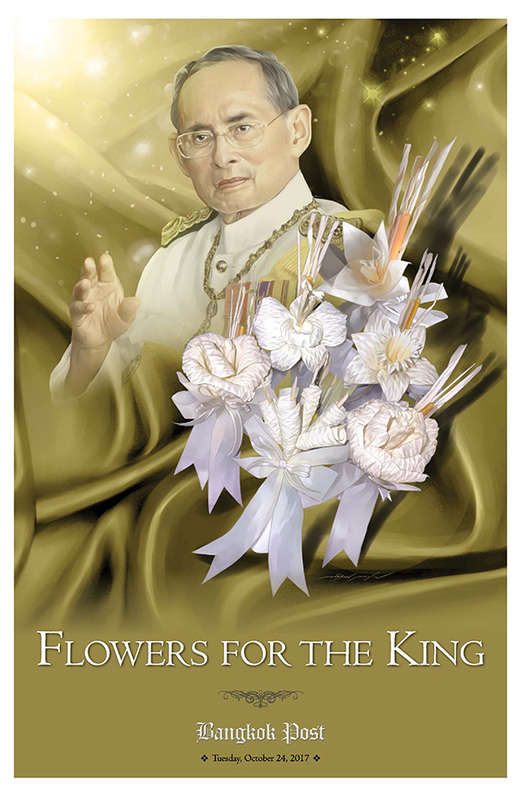 For the royal cremation for the late King Bhumibol Adulyadej, Phra Chittakathan is placed inside the principal Busabok. 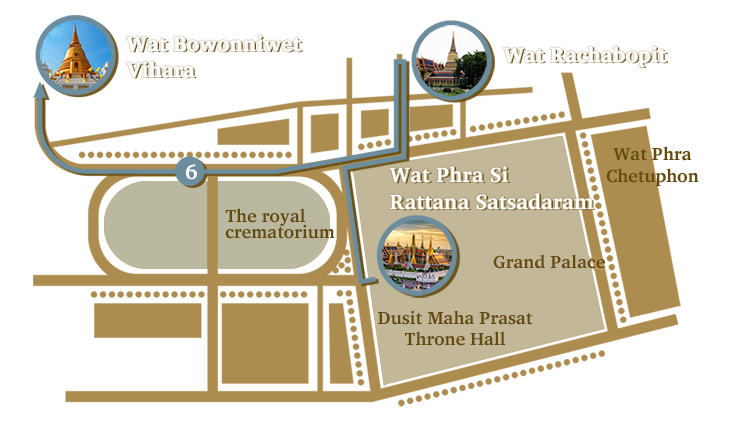 The royal crematorium for the late King is made up of nine Busabok structures. The principal Busabok stands at the centre of the top layer of the Phra Meru Mas' base. 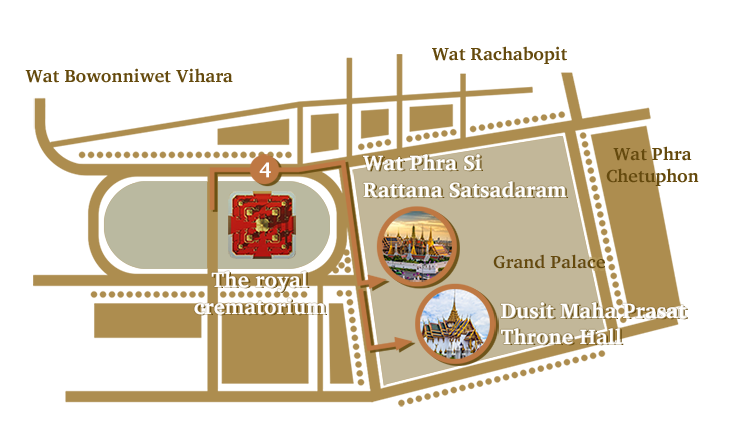 It has a seven-tiered and spired roof and houses the royal pyre where the royal cremation takes place. Chak Bang Phloeng is a kind of foldable, beautifully painted screen or partition placed on each of the four sides of the principal Busabok. 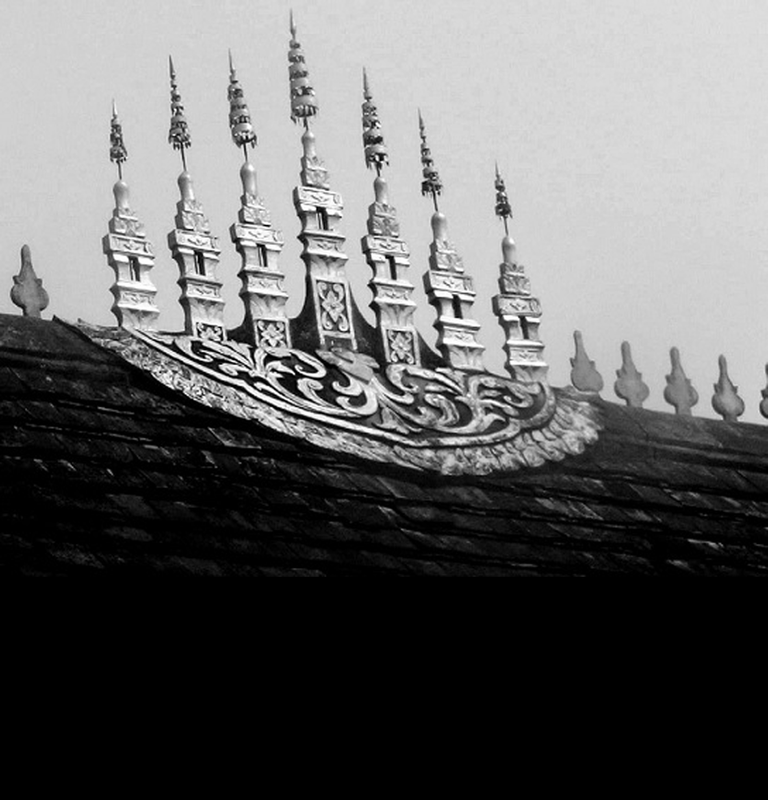 It serves as a shield against wind and blocks the view of something not intended to be seen during the royal cremation. 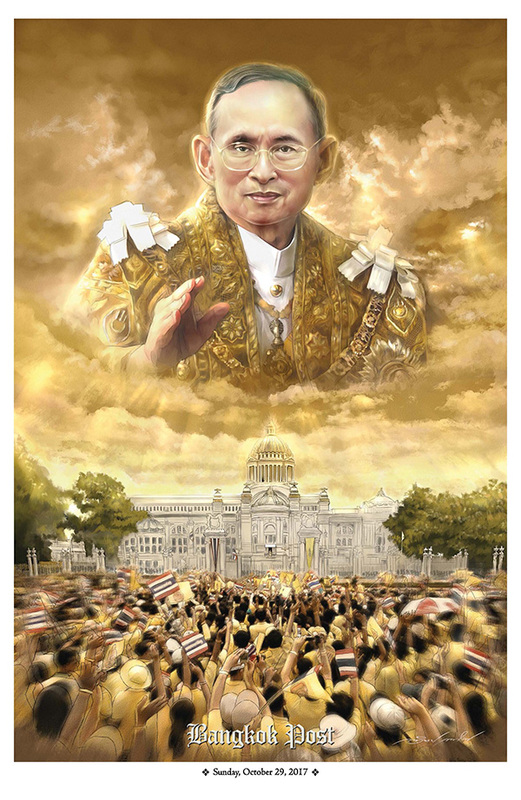 The Chak Bang Phloeng for the late King's royal crematorium feature paintings depicting activities relating to the more than 4,000 royal development projects initiated by King Rama IX during his 70-year reign. Sang is a smaller Busabok-shaped pavilion placed on each of the four corners on the same level of the main Busabok. A group of four monks will sit and prayer inside each of the structure during the royal cremation rites. Ho Pleuang is the four Busabok-style structure on each of the four corners on the second tier of Phra Meru Mas's base. Ho Pleuang is used to keep the royal urn and other paraphernalia such as fire wood, and dok mai chan or sandalwood flowers. The first lowest layer of the royal crematorium's base is surrounded by ceremonial fences called Ratchawat and adorned with royal umbrellas and statues of kneeling angels holding ceremonial fans called Bang Saek. Each of the four corners of this level is placed with the statues of the four guardian deities of the Earth, known in Thai as Thao Chatulokkaban. Around the base are ponds and small replicas of mountains decorated with sculptures of mythical creatures from the Himavanta Forest, known as Himavanta mythical animals. On each of the four corners of this level is the Busabok-shaped Ho Pleuang where the royal golden urn and the royal urn made of sandalwood, and other paraphernalia are kept. The main Busabok sits at the centre of this level. The tip of the Busabok is adorned with a white, nine-tiered umbrella of state called Nopphapadon Maha Sawettra Chat. The principal Busabok is open on four sides with no wall. It is decorated with a royal curtain and each of its four sides is adorned with partitions or Chak Bang Phloeng featuring paintings of various avatars of Hindu god Vishnu, as well as depicting activities relating to the late King's royal development projects. The Sang is also located on each of the four corners of this top level. In the old belief, the King has divine status. The concept of trai bhum, or Buddhism cosmology features the universe and the existence of heaven and hell. 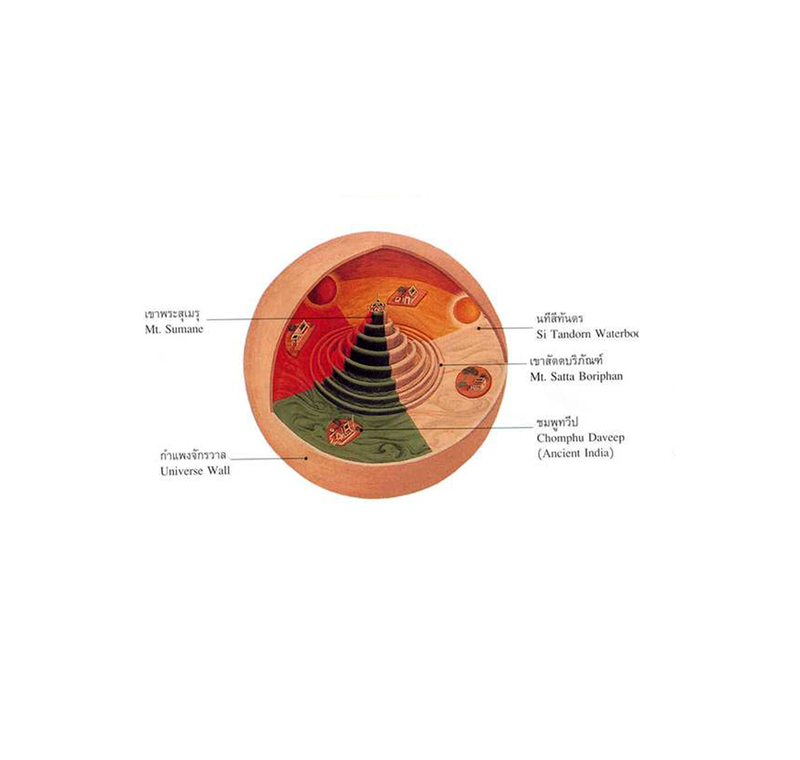 The so-called universe concept comprises the centre, which is Mount Sumeru, surrounded by Mount Sattaboripan, the ocean and four continents where people live. The highest place serves as heaven where deities stay. It is believed the King is Narayana, who comes to earth for the sake of the world’s peace. When he dies, he returns to Mount Sumeru, the centre of the universe. 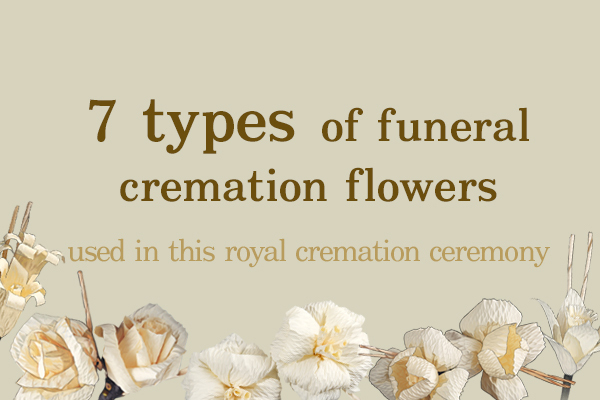 The royal cremation is traditionally fashioned around this belief. The pyre is made in gold, called the Phra Meru Mas, which resembles Mount Sumeru. Technicians model the universe concept around the pyre, its landscaping, architecture and all elements at the cremation place. 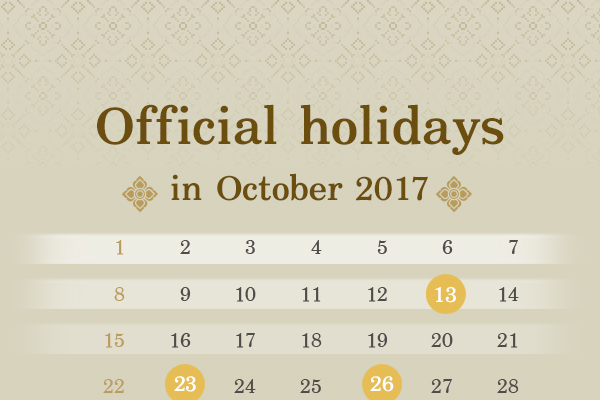 The Phra Meru Mas for King Rama VIII was designed by Phra Phrombhichitr, a disciple of HRH Prince Narisaranuvattivongse. He drafted the design in line with his teacher’s ideas. Phra Meru Mas came with the busabok pyramidal design with a mondop spire decorated with Brahma god faces. Its base was embellished with perforated, tiered umbrellas and deity figures. 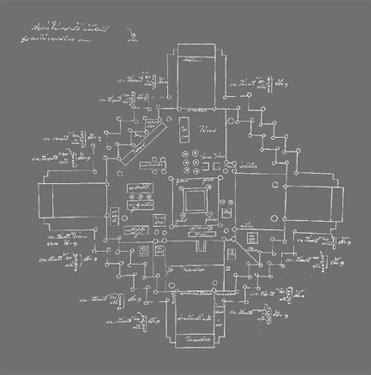 At that time, the construction was documented in detail, including photos as well as a models which could be studied by successive generations of architects concerning their technical details, use of materials, wood laying and construction steps. Using wood structure and wood battens to build the roof of the royal crematorium. 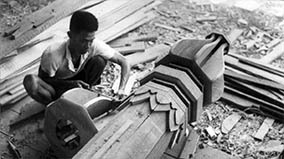 A craftsman applies his wood carving skills to create wood patterns and designs. 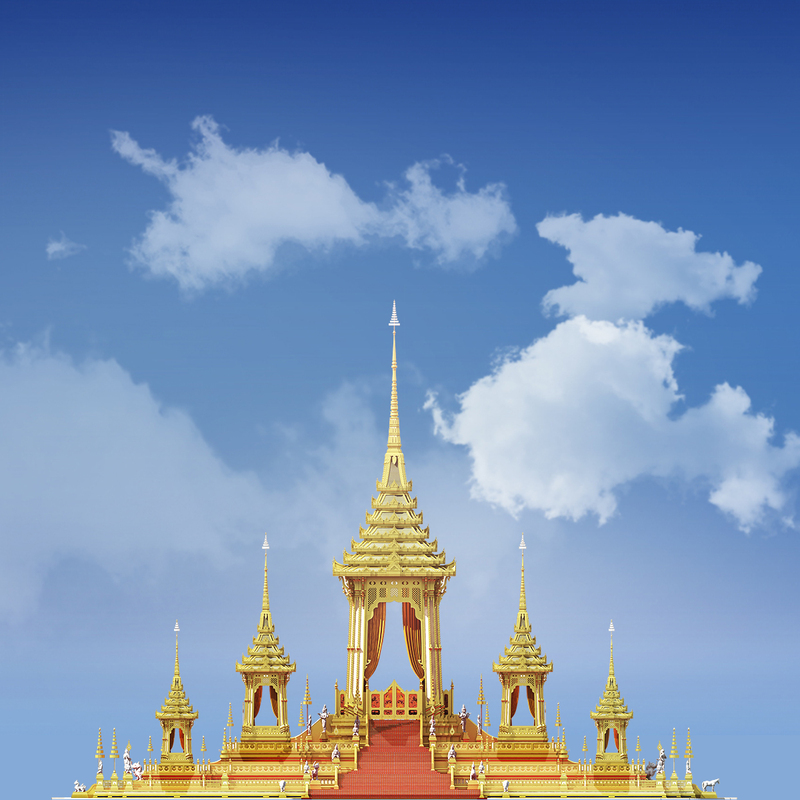 In building a royal crematorium which only serves as a temporary structure, no gold leaf and stained glass are used. 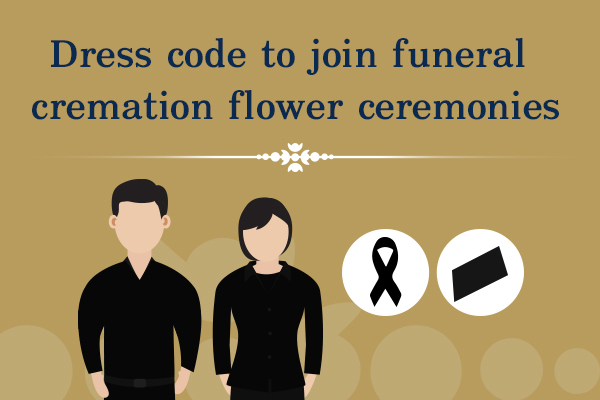 Instead, the royal crematorium will be decorated with fretwork patterns on golden paper or golden cloth. 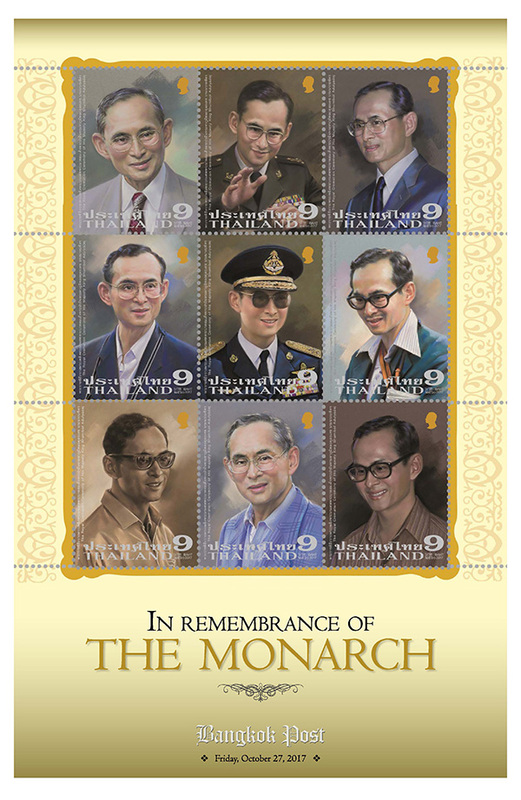 The Phra Meru Mas for King Rama VI was designed by HRH Prince Narisaranuvattivongse. It features the budsabok shape with a mondop spire in the same pattern as that of King Rama V. The spire was decorated with faces of the Brahma god, and above it was the “Wachirawut” symbol (the King’s name). It was also decorated with a nine-tiered umbrella. 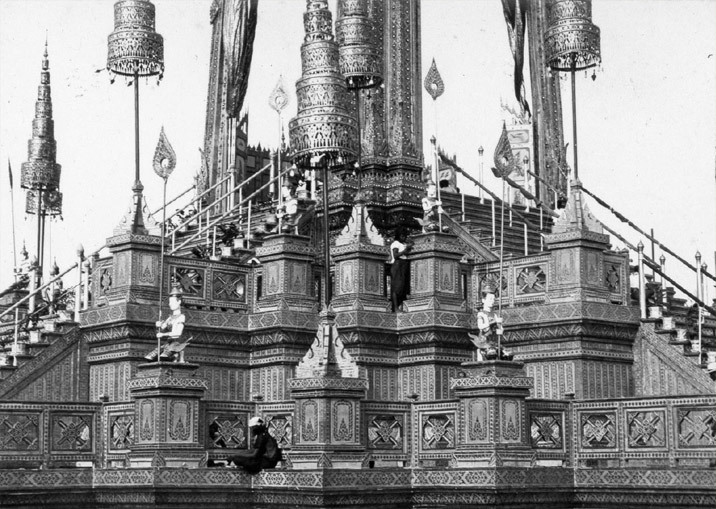 Its base was embellished with perforated, tiered umbrellas and deity figures holding phumkaobin-shaped candle holders. A small pavilion, called ho pleuang, was also set up in the eastern Phra Meru Mas for storage and as a workers’ shelter. 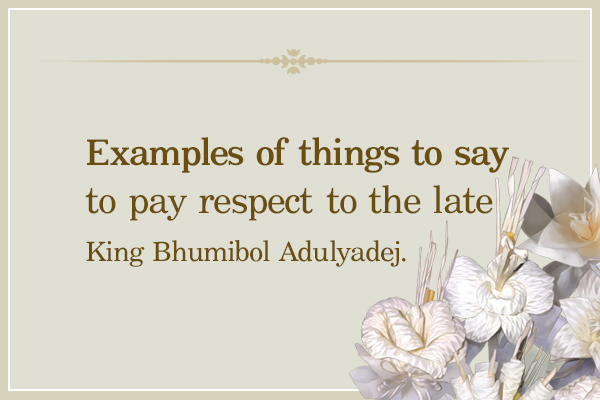 The designers created a few new components but still adhered to the concept of Trai Bhum and symbols related to King Rama VI. The spire on top of a royal crematorium is designed in the shape of the face of Hindu God Brahma. 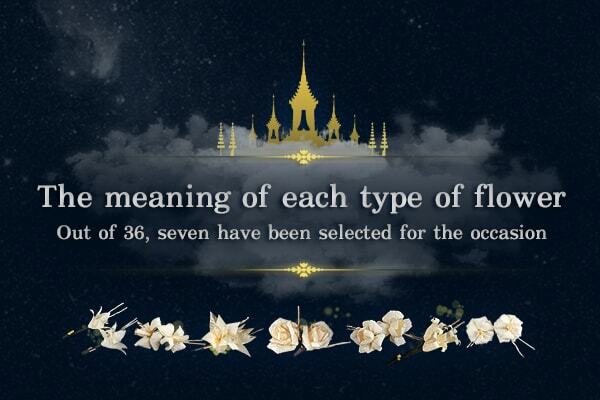 The top of the spire is designed in the shape of ''Vajiravudh'' -- the royal emblem of King Rama VI. Hor Plueang (dismantling pavilion) is used to keep the royal golden urn and other paraphernalia. The base of a royal crematorium is decorated with tiered umbrellas and statues of angels holding ceremonial fans. 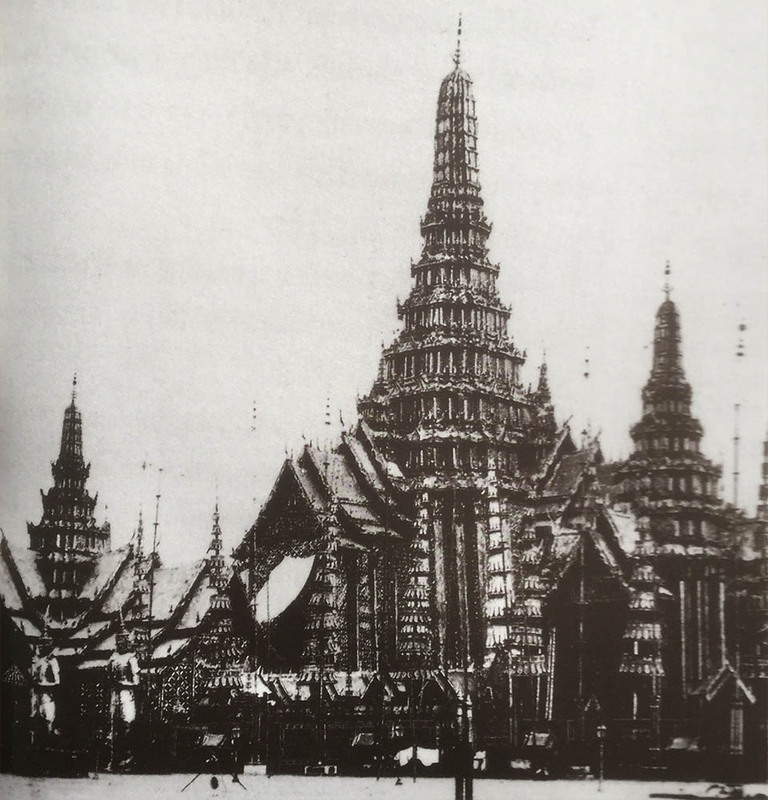 Before King Rama V, the Phra Meru Mas was a sizable structure. But in the rein of King Rama V, the design was adjusted to scale down the structure, based on the King’s initiative. The King said: “In the past, when monarchs passed away, there was a need to build magnificent meru. Those who had not seen them before may have not been imagined how big they were. "It is a waste of human labour and money. Doing such a thing now would not suit changes in the country. It neither entails longer honour nor benefits anyone. 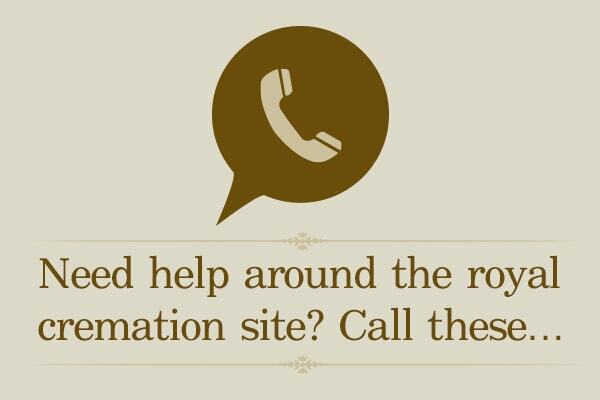 This in turn causes trouble for others. If the bodies of benefactors or those with honour should be treated with dignity, I may not try to scale it down for fear that people may misunderstand whether these people misbehaved with the result their bodies are not being treated as well as they should be. "As for me, I have no difficulty. I can say clearly. I want an end to such large Phra Meru. It should be a proper size to suit a cremation at Sanam Luang." The King’s Phra Meru Mas was scaled down accordingly. The grand structure was revoked in favour of a busabok-shaped Phra Meru. However, it still maintained its exquisite and dignified designs in honour of the King. From that, the busabok-shaped Phra Meru Mas served as a prototype for later kings. 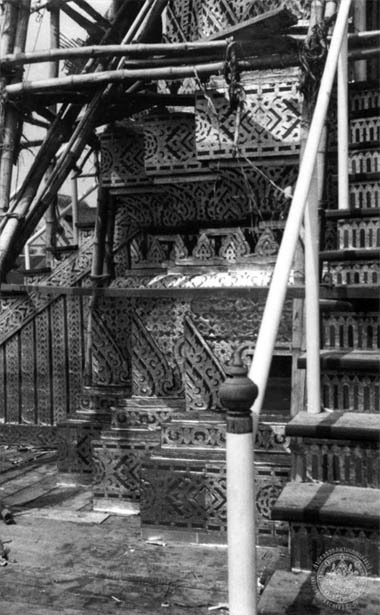 A staircase leading to a royal crematorium is adorned with fretwork embroidery with handrails made in the shape of Naga -- mythical serpent-like creatures. Chak Bung Phloeng or a fire screen, features paintings of deities. Sang is a pavilion placed on each of the four corners on the same level of a royal crematorium. It is for monks to sit and prayer. 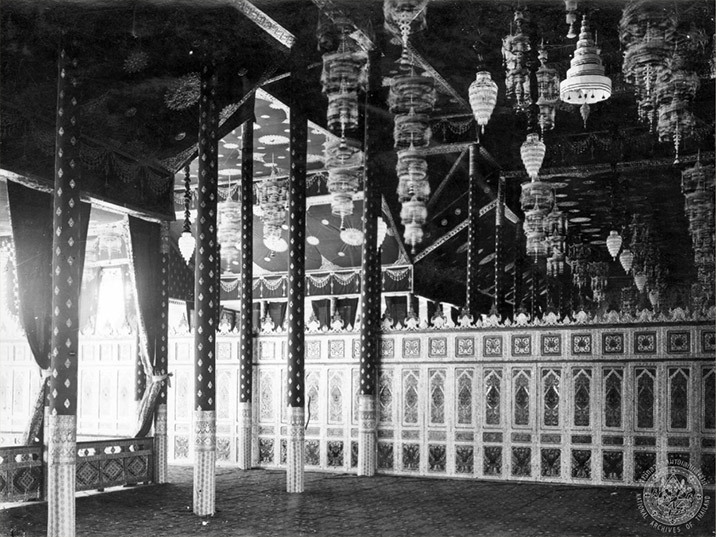 Interior decoration of Phra Thinang Song Tham -- a temporary building where His Majesty the King perform merit-making rites during a royal cremation ceremony. The Phra Meru Mas for King Rama IV adopted the old model passed down from the Ayutthaya Kingdom. The two-tier structure is 80 metres high. A pavilion with four gable ends and a spire was built outside. Its structure is made from wood and decorated with bamboo and paper. Woven bamboo is included in its base and wall, decorated with gold coloured paper. Situated in the inner area was a golden meru, which sheltered seven tiers of golden phra benja with a Great White Umbrella of State above. There was a fireguard decorated with a coloured screen. Six meru gates were decorated with gold, silver and pink gold umbrellas. A dharma royal pavilion is built in the southern end of the meru. The Phra Meru Mas is built for a particular job and its structures and architecture highlight the temporary use of materials and designs. In the past, the Phra Meru Mas was made mainly from wood such as bamboo and hardwood. Today, construction materials include more modern alternatives. 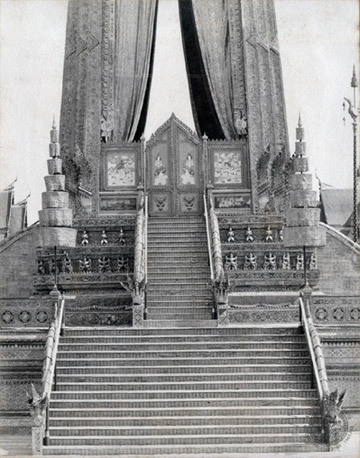 Regarding the Phra Meru Mas for HRH Princess Srinagarindra, most of the structure consisted of hardwood and steel. After the ceremony, these materials could be removed and used for other purposes. 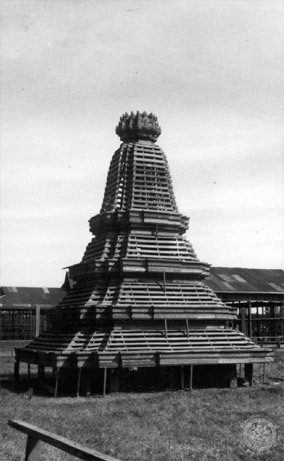 In the past, timber was required for the Phra Meru Mas and much of that wood was later discarded. Today, the architectural structures, including poles, ruay raga (roof component) and tympana, do not need to be made from wood entirely, but in some cases can be made from resin. 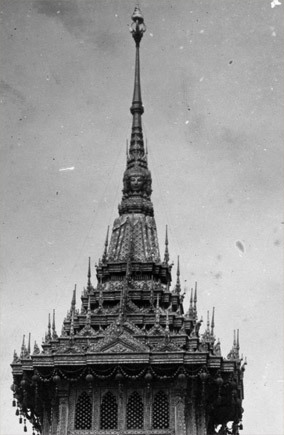 According to royal ancient traditions, a royal crematorium for the funeral rites of a king was traditionally built in the shape of a massive prasad (Thai-style castle), with the roof either in the shape of prang (a Khmer-style tower-like spire) or in the shape of mondop -- a square and cubical shaped pavilion with a spired roof. 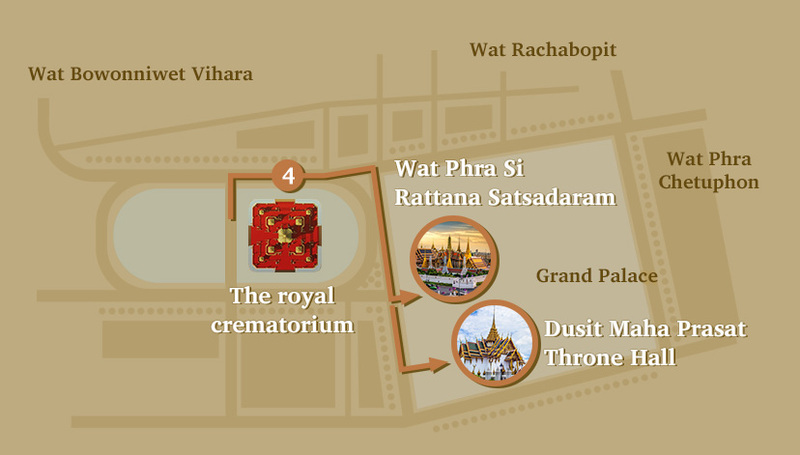 The royal crematorium for King Rama I was constructed at Sanam Luang according to royal ancient traditions. 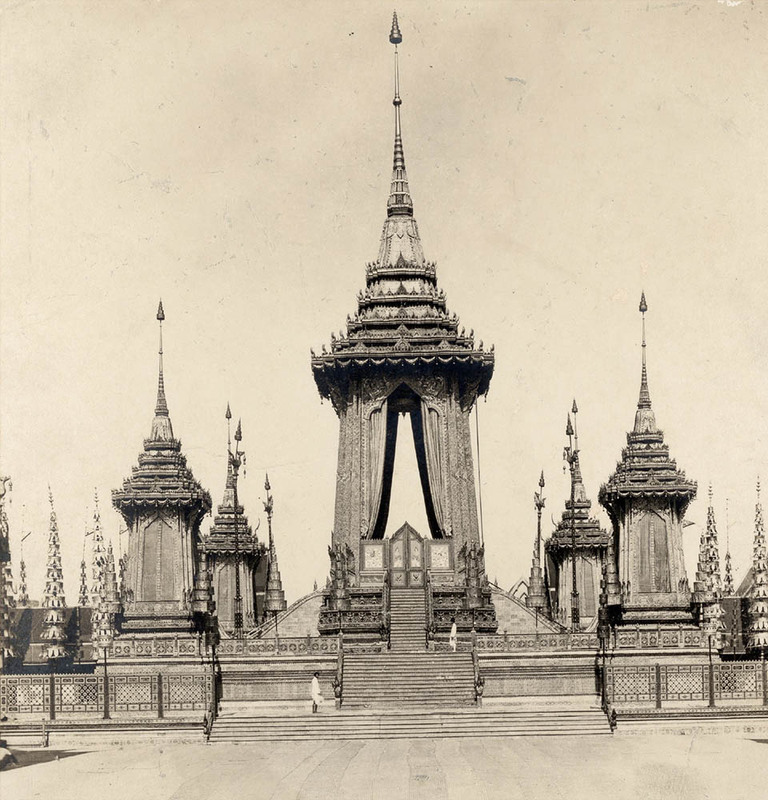 It served as a model for construction of royal crematoriums for the succeeding monarchs in the early Rattanakosin period -- King Rama II, King Rama III and King Rama IV. 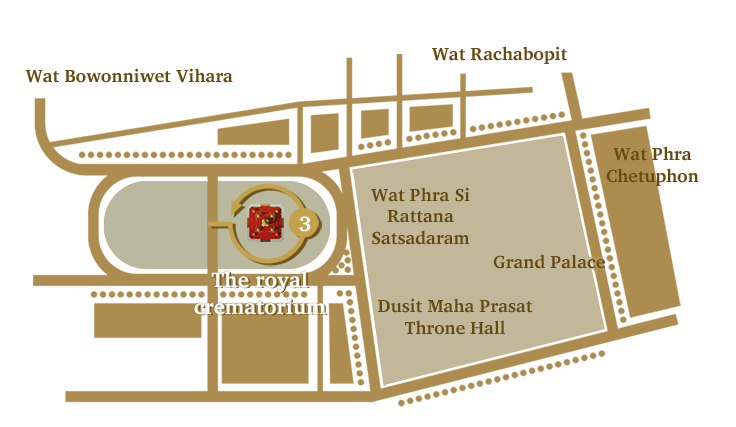 The layout of a royal crematorium of Princess Sudawadi, the daughter of King Narai of the Ayutthaya period. 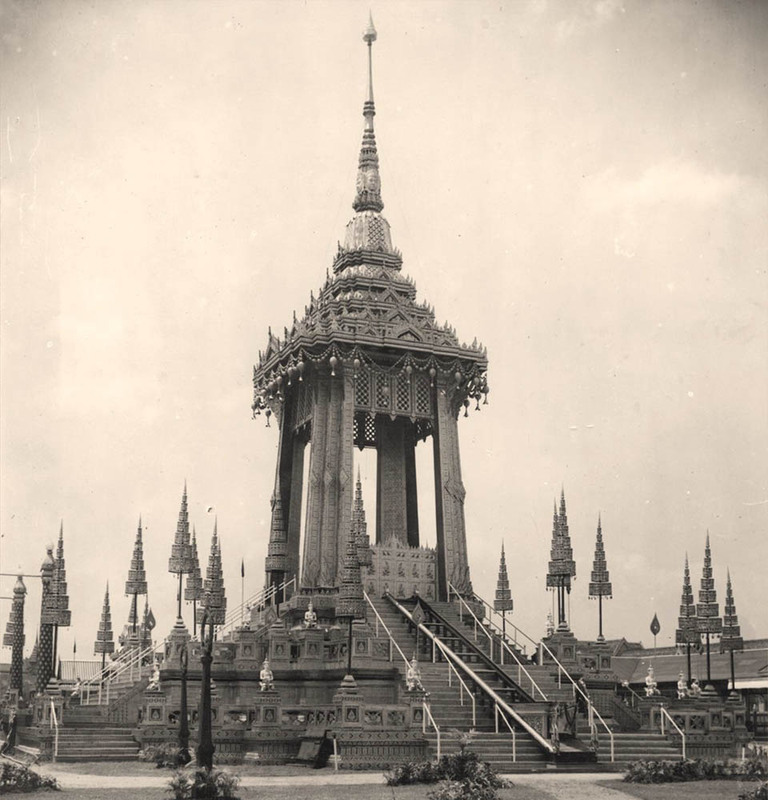 It served as a model for construction of royal crematoriums in the early Rattanakosin period. 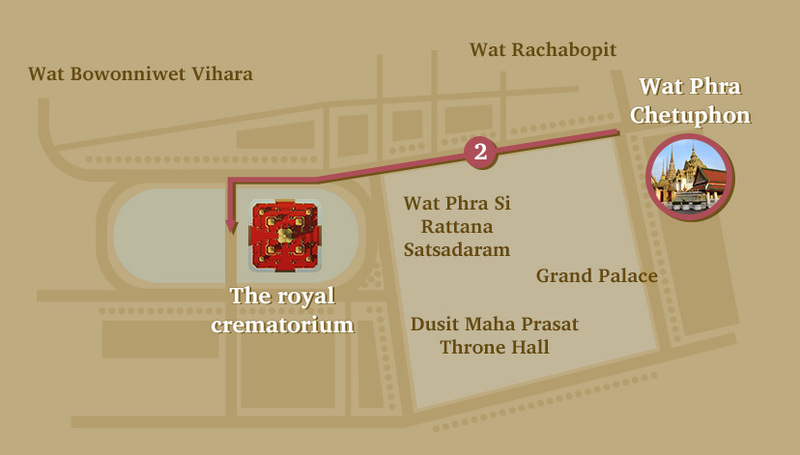 The area around the base of a royal crematorium. 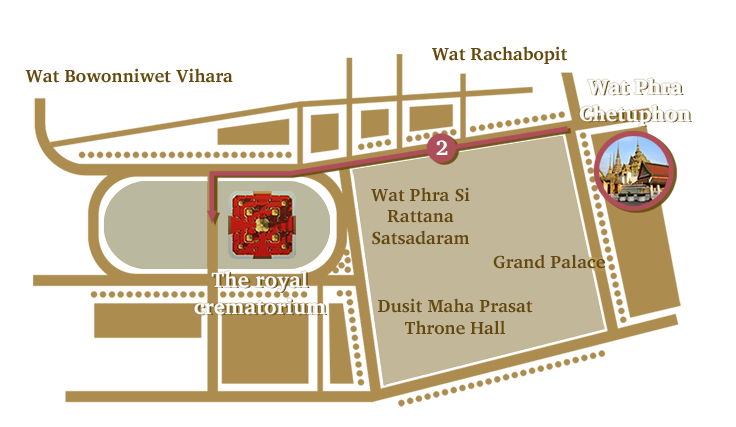 In designing the royal crematorium, the designers adopted a layout plan resembling the universe based on Thai philosophy and beliefs. 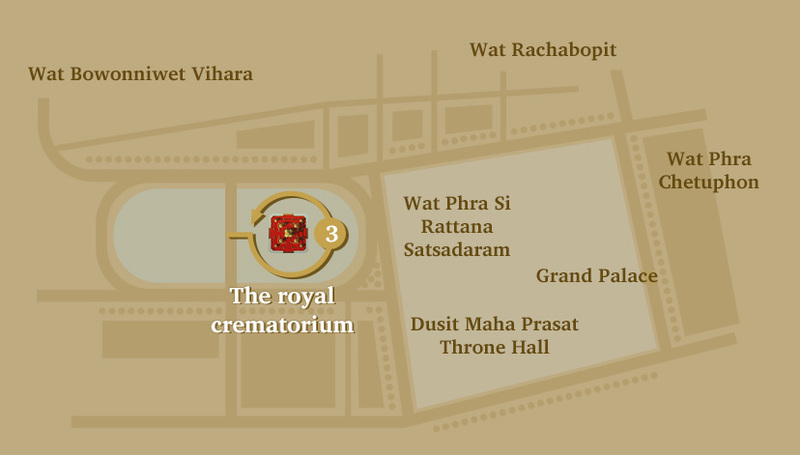 The centre of the royal crematorium — which marks the focal point of the philosophical universe — is where two invisible axes intersect; one running from the spire of the Phra Si Ratana Chedi pagoda in the adjacent Wat Phra Si Rattana Satsadaram and the other from the middle of the phra ubosot in the nearby Wat Maha That Yuwarat Rangsarit Ratcha Wora Maha Wihan. The landscape surrounding the northern and southern entrances of the crematorium is designed to symbolise the royal duties of the late King Bhumibol Adulyadej and the royal projects which are the King's brainchild. Close to the main entrance to the royal crematorium is a pond that is a visual representation of the kaem ling (monkey cheek) water retention areas for which the King was known. Close by are the Chai Phatthana water turbine and a paddy field surrounded by earthen dykes built in the shape of the Thai-style number nine in mixed colours of gold and of soil. The creation of these sculptures was based mainly on beliefs about the universe and Mount Meru (a sacred cosmological mountain with five peaks in Hindu cosmology). On top of that, is a special life-size sculpture of Thong Daeng, the late King Bhumibol Adulyadej's pet dog. The sculpture is placed close to the royal funeral urn to demonstrate the bond between King Rama IX and the dog he raised. The Phra Meru Mas is a sizable crematorium used in the cremation ceremony for the monarch, the supreme royal consort, queen, princess mother, prince of the front palace and crown prince. Their death is referred to as sawankhot (to pass away). 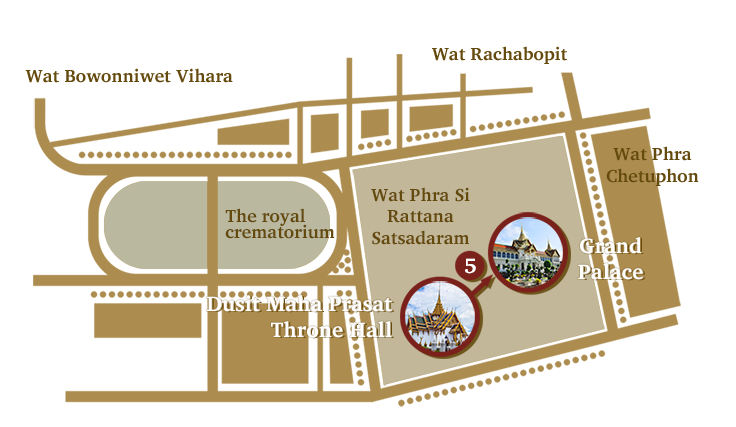 The Phra Meru Mas includes a phra mane thong (Golden Inner Crematorium). There are two types of Phra Meru Mas. One has a castle shape. This traditional structure is huge. Another is the busabok pyramidal design. 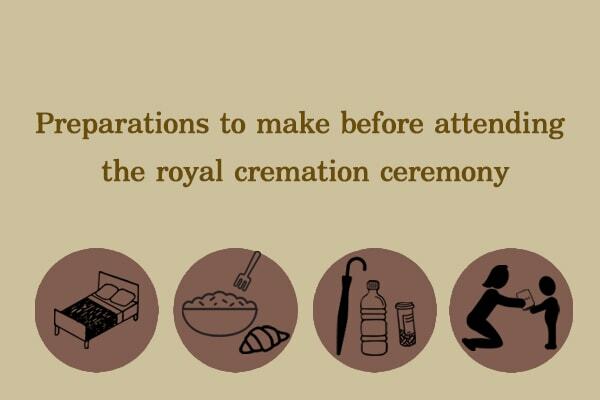 This was first used in the cremation ceremony of King Rama V, who said this traditional cremation ceremony required too much labour and money. The busabok-designed crematorium has been used since. This building is for His Majesty the King and members of the royal family to attend a sermon and a merit-making ceremony when the ceremony is underway to transfer the body of the late King Bhumibol Adulyadej to be cremated in the royal crematorium. The pavilion is also for receiving royal guests, privy council members, cabinet ministers, high-level civil servants (both soldiers and civilians), members of parliament, and diplomats having an audience with the King. These are halls designed for receiving the King and royal family members during their wait to observe the procession formation to the royal funeral. 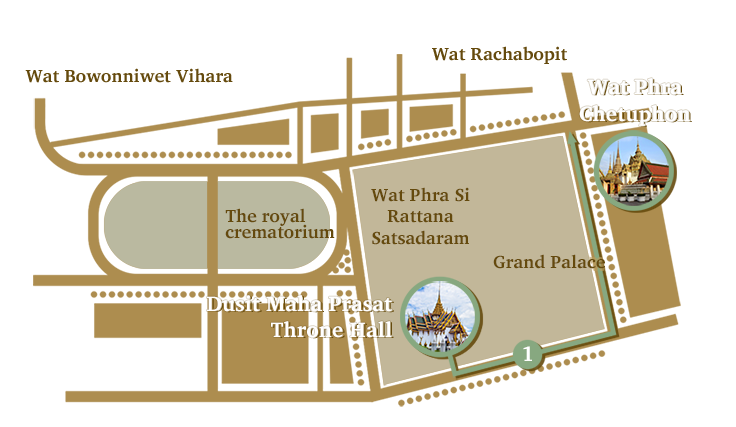 There are three pavilions in the same cluster, namely the elevated pavilion in front of Wat Phra Chetuphon Wimon Mangkhalaram, the pavilion in front of Sutthai Sawan Prasat Throne Hall and the elevated pavilion near Sanam Luang near the front gate of the royal funeral site. This wall-less hall is where senior-ranking officials gather and are granted an audience by His Majesty the King. 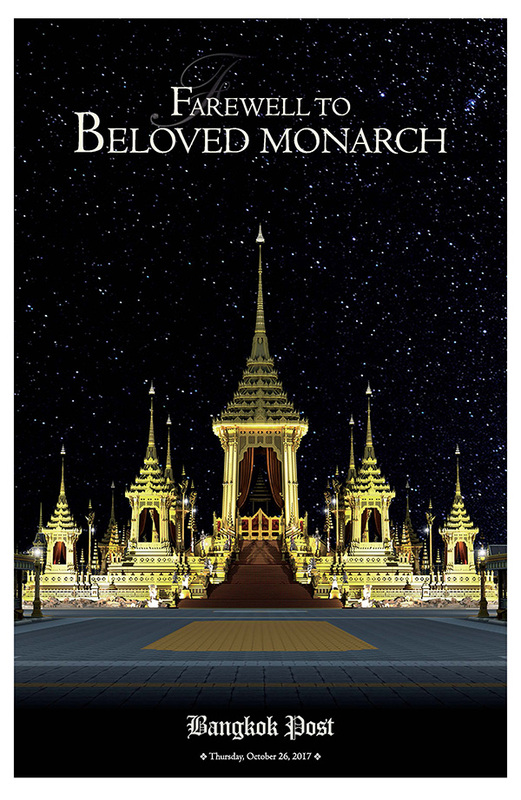 It is also where they congregate during the royal funeral ceremonies. 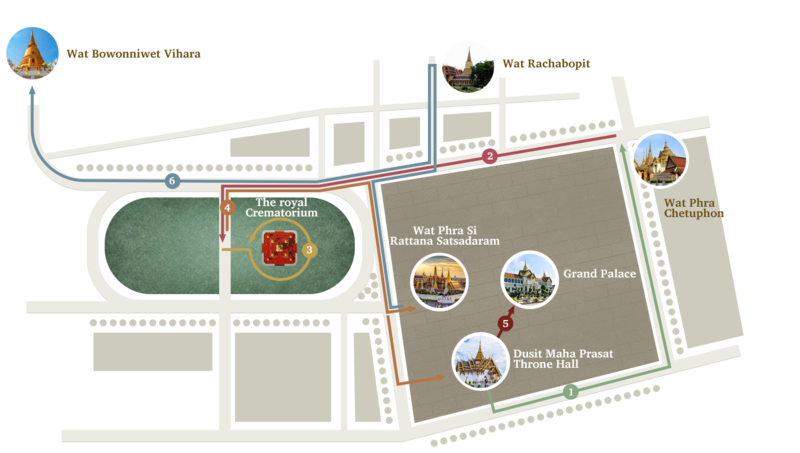 The pavilions, each situation in the four corners of the royal funeral ground, serve the purpose of designating the boundary of the ground perimeter. They are also where funeral officials take a break from duties. 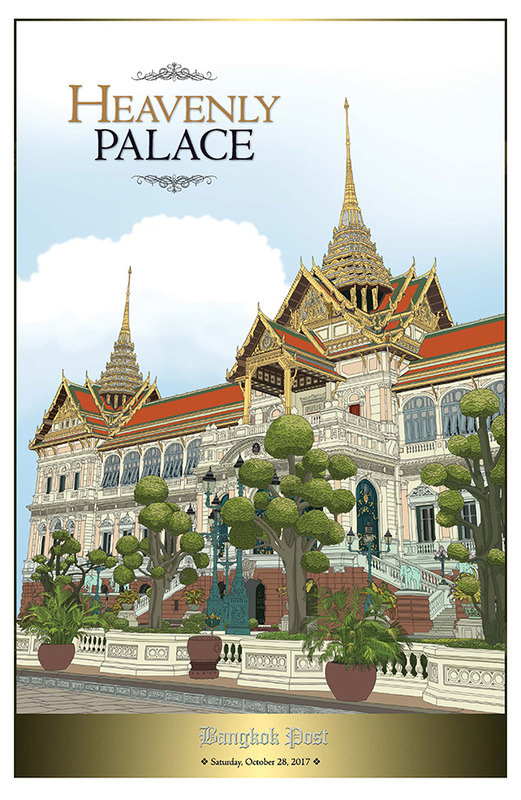 Each pavilion has a triangular structure built above the entrances and doors, richly decorated to emulate the architectural style of the Phra Meru Mas (royal funeral pyre) with long walls extending from both sides of the pavilion all the way to the Ratchawat fence. This is where monks, royal physicians and officials take a rest and also where the Thai traditional music ensemble performs during the royal funeral ceremonies. Each pavilion is built adjacent to each of the four sides of the Ratchawat fence. The front of the pavilion is open whereas the sides and the back are walled. The cremation ceremony at the Phra Meru Mas, or funeral pyre for royals, signifies in Buddhist cosmology that the deceased King has returned to Mount Sumeru, where he came from before being born as a human. 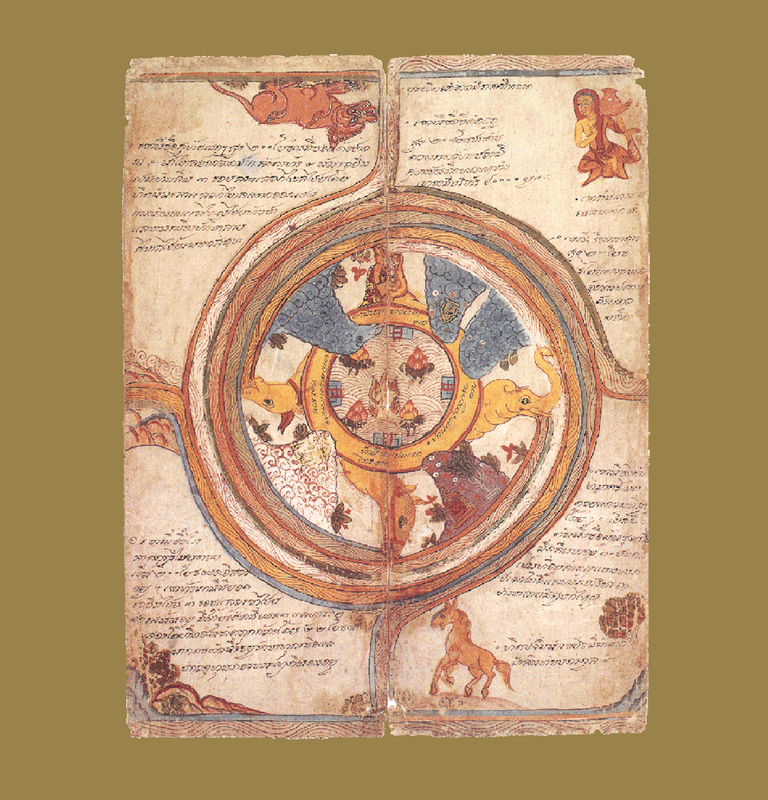 A "universe" concept in Buddhism cosmology including Mount Sumeru is portrayed in the crematorium, as expressed in its architecture and component parts. It also includes the Sattaboripan mountain ranges and areas where deities, demons, garudas, nagas live. It also includes the Himmapan forest, where Vidyadhara, Gandharvas, Kinnarah and other creatures stay. The four sides of the Phra Meru Mas represent the four continents surrounding Mount Sumeru. Mount Sumeru is believed to be the centre of the universe based on Brahma and Buddhism principles. It is the place where various kinds of gods and deities are thought to be present. At the top of Mount Sumeru, a Tavatimsa heaven sits, ruled by deities with Indra as the supreme leader. According to Brahmin and Buddhist religions, Mount Meru is the mountain which serves as the centre of the world or universe. The mountain is an abode of gods and spirits from several dimensions, ranging from spirits living in hell, garuda, naga, giants, gods and hermits. The mountain is also supported by Arnon gigantic fish. Mount Sattaboripan is a mountain in Buddhist mythology situated in the middle of Himavanta, a mythological forest. The mountain comprises seven ranges, called Yukolthorn, Isinthorn, Korawik, Suthat, Neminthorn, Wintaka and Assakan. The mountain ranges encircle Mount Meru. Each range is partitioned by the Si Than Don River. On top of Mount Meru is a heaven, called Mount Sattaboripan. Anodard Pond is the pond which receives water from all watercourses. Lying across the bottom of the pond are a sacred stone plate, called Manosila, and holy soil, called Horadal, which can used to scrub the body. The water in the pond is pure and clean. There are several platforms for bathing. The pond serves as a place where Buddha, Pratyekabuddha (a lone or private buddha), Buddhist saints and deities including hermits, demigods, giants and naga take a shower. Situated on the four sides of Mount Meru are four continents: Uttarakuru Thawip in the north; Purvavideha in the east; Jambu Thawip in the south, or the world; Aparagodaniya in the west. Each continent also houses 2,000 other subcontinents. 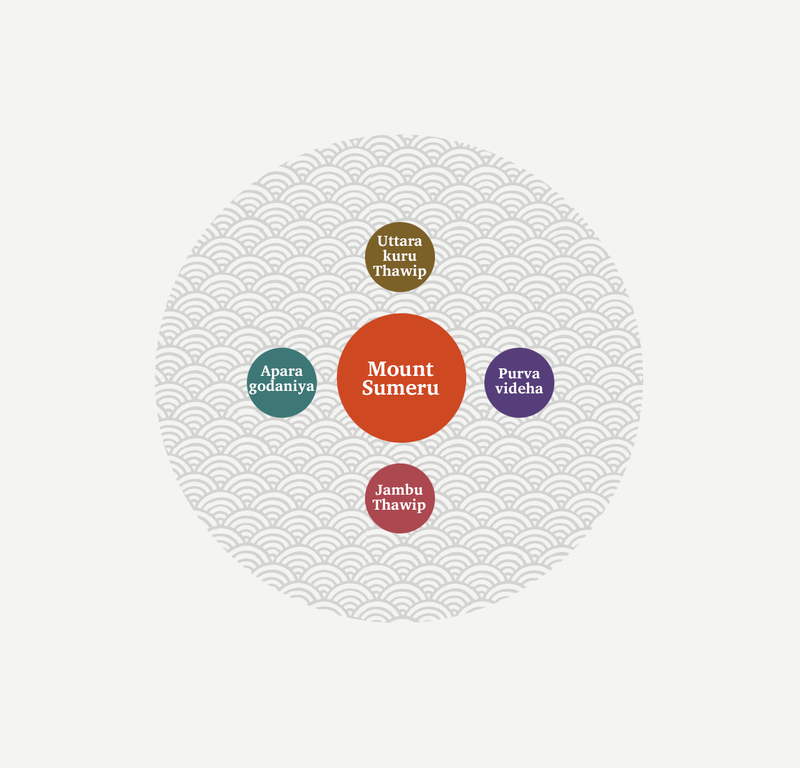 Mount Meru also is surrounded by four great oceans in four directions. 1. Pitasakhon in the north; the place is full of golden water. 2. Palikkasakhon in the west; the ocean is brimming with crystal clear water. 3. Khirasakhon or Kshir Sagar (the Ocean of Milk) in the east: the place is filled with milky white water. 4. Nilsakorn in the south; the ocean filled with blue-violet water. 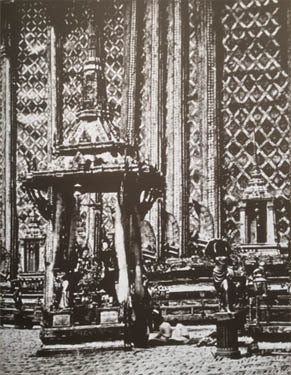 The transfer of the royal remains from the Dusit Maha Prasat Throne Hall to the royal crematorium, the transfer of royal relics from the royal crematorium to the Grand Palace, or the transfer of royal ashes to be enshrined or scattered at sea proceeds on a grand ceremonial procession where dozens of pullers and bearers are deployed. 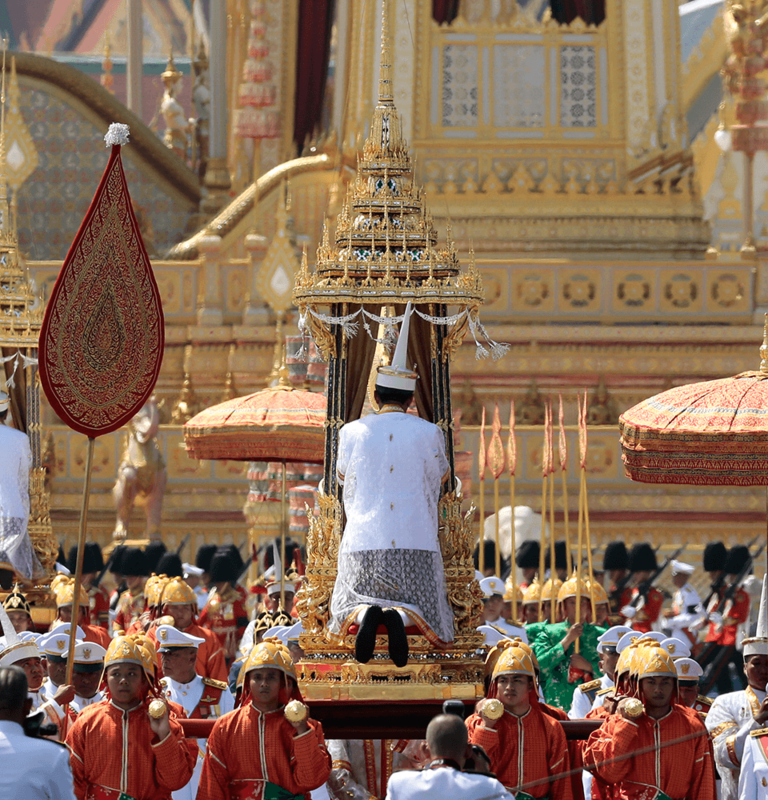 The grand ceremonial procession for King Bhumibol Adulyadej is made up of six processions. Royal chariots, vehicles, palanquins and other items reflecting his revered status and rank have been renovated or repaired for the task of moving and carrying the royal remains, relics and ashes. 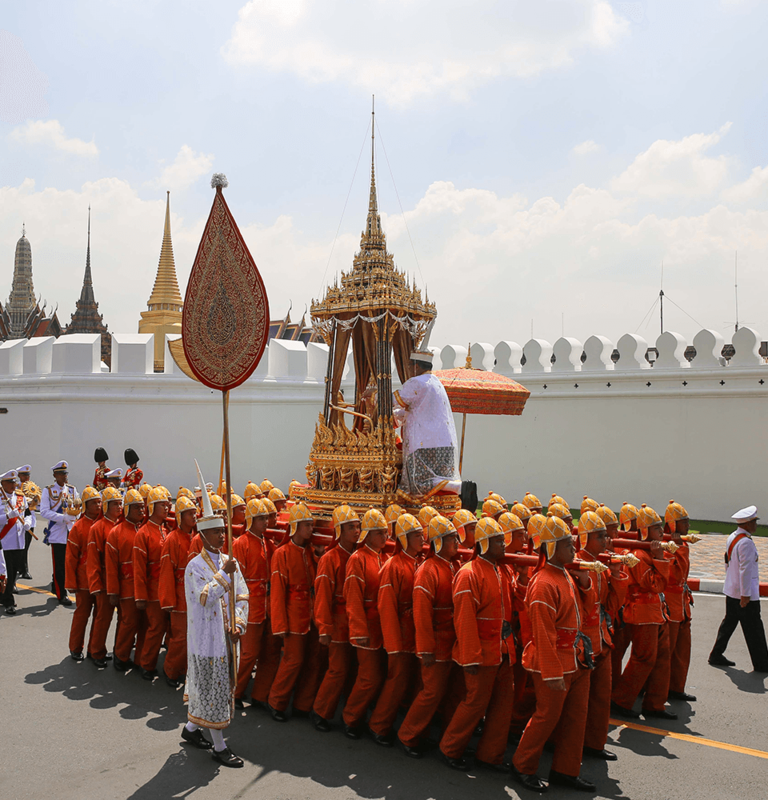 The pullers and bearers take part in partial and full rehearsals to ensure the funeral procession for the late King proceeds in a manner conjuring an image of him ascending to heaven. 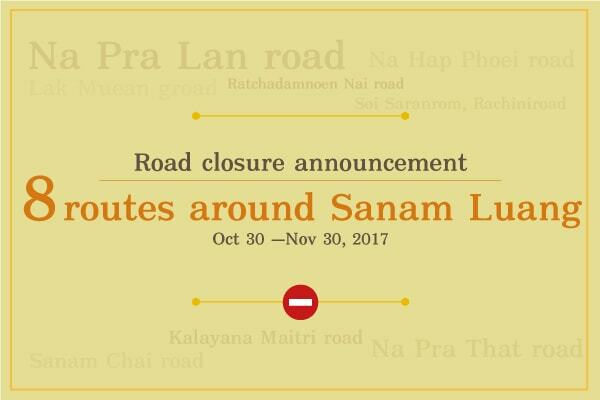 Phra Yannamas Sam Lam Khan is a large palanquin with three poles. Made of carved wood, gilded and lacquered, the structure is used to carry the royal urn from the Dusit Maha Prasat Throne Hall to Phra Maha Phichai Ratcharot. 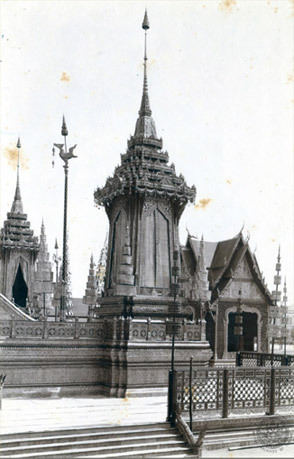 The royal urn is carried by Phra Yannamas Sam Lam Khan from the Dusit Maha Prasat Throne Hall via Deva Phirom Gate to Maharat Road. The procession turns left to Tai Wang Road heading to Sanam Chai Road where the royal urn is moved to Phra Maha Phichai Ratcharot in front of Wat Phra Chetuphon. 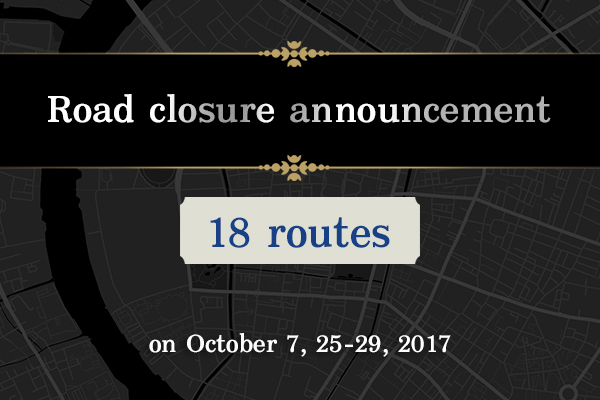 The distance is 817 metres and the procession is expected to take about 30 minutes. 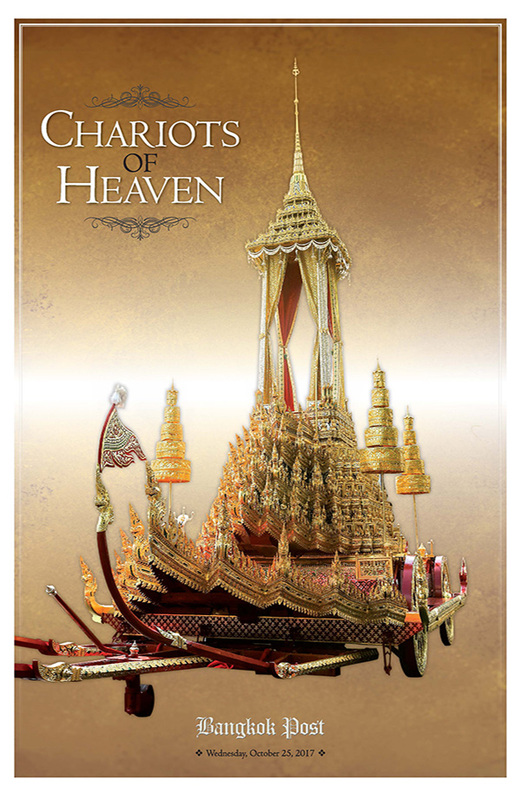 Made of carved wood, lacquered and gilded, and decorated with glass tiles, Phra Maha Phichai Ratcharot is a royal chariot in the shape of a busabok, or small elaborate pavilion throne. 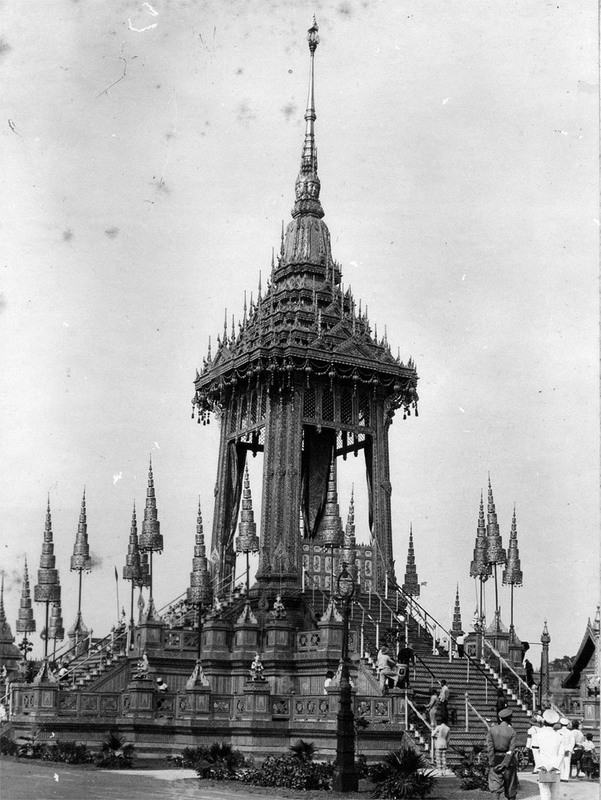 The Royal Chariot of Great Victory was built during the reign of King Rama I for use in the royal cremation of his father in 1796. The structure was later used to carry the royal urns of several earlier kings, queens and high-ranking royals. The naga-shaped apparatus is an ancient ramp for raising or lowering the royal urn to the royal chariot or the royal crematorium. Before this equipment was introduced, men were used to carry the royal urn up or down with the help of scaffolding. After the royal urn is transferred to Phra Maha Phichai Ratcharot by the use of the Kroen Bandai Nak, the procession moves along Sanam Chai Road to Ratchadamnoen Nai Road and to Sanam Laung. The distance is 890 metres and the procession is expected to take about two hours. This royal cannon-equipped chariot is used to carry the royal urn of a king or a high-ranking royal holding a military rank in lieu of Phra Yannamas Sam Lam Khan from the Grand Palace or any other palace to the royal crematorium. The royal urn is carried to the royal crematorium. 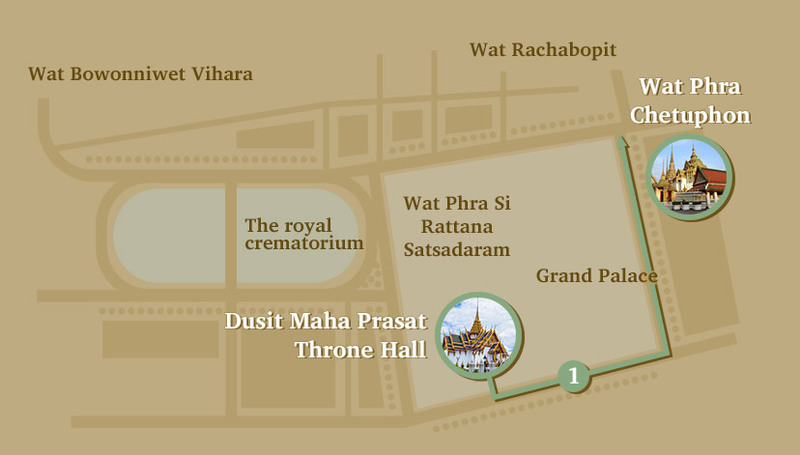 The procession goes around the royal crematorium three times in a counter-clockwise direction. 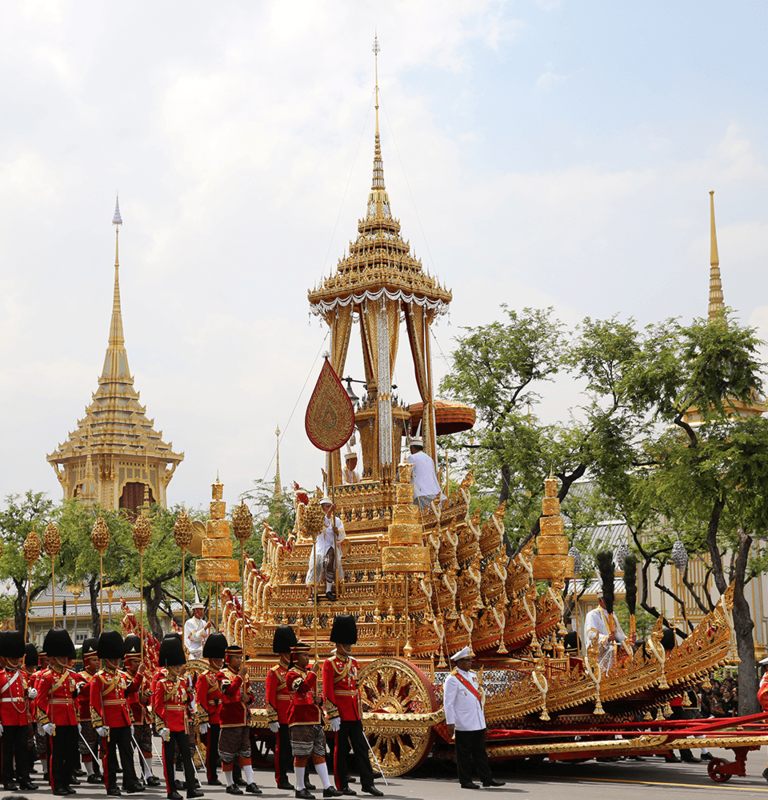 The palanquin was built during the reign of King Rama I in the shape of a busabok with a five-tier roof. Made of carved wood, the structure is gilded, lacquered and decorated with glass mosaic tiles. The base of the structure is embellished with figures of the khrut yut nak (garuda-holding naga). The Rajendrayan has four poles and is carried by 56 men. 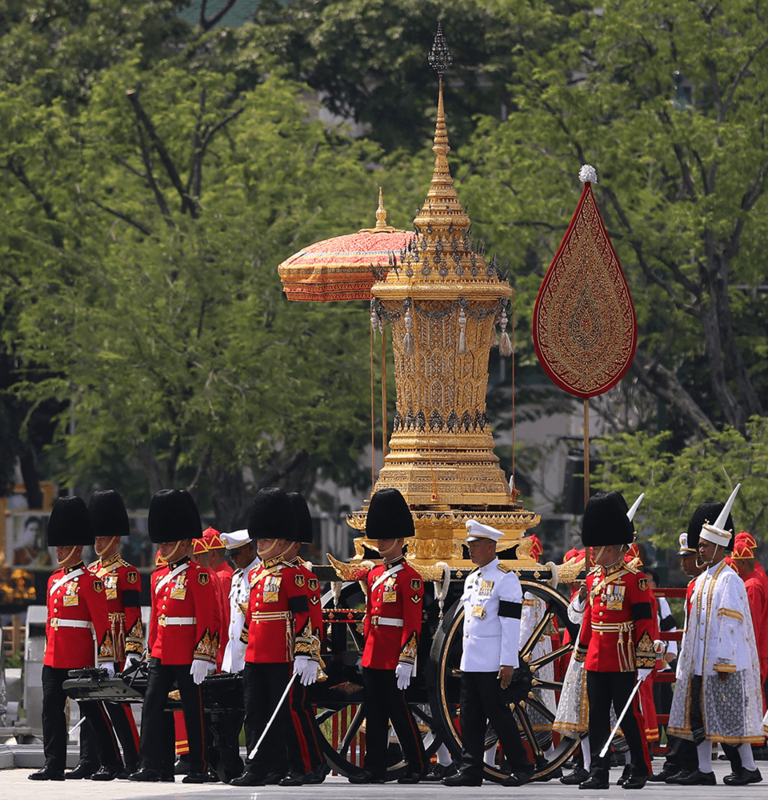 The royal cinerary urn carrying the royal relics is transferred from the royal crematorium to the Rajendrayan and the procession proceeds to the Grand Palace. 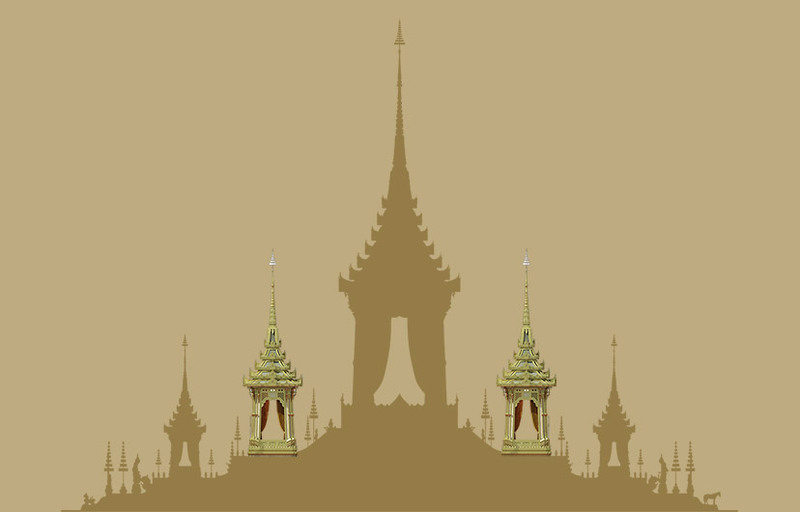 This structure is used to carry the royal ashes container to Wat Phra Si Rattana Satsadaram in the Grand Palace. Built in the shape of a busabok, the palanquin is made of carved wood, gilded and lacquered and decorated with glass mosaic tiles. The Rajendrayan Noi has four poles and is carried by 56 men. 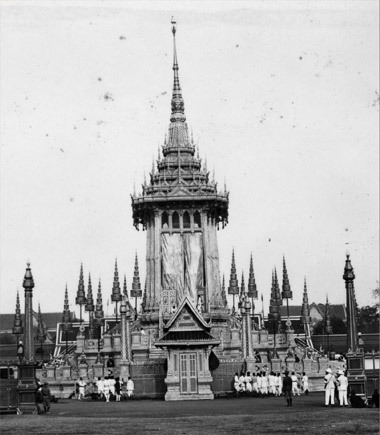 The royal cinerary urn carrying the royal relics is moved from the Dusit Maha Prasat Throne Hall to Phra Wiman on the Chakri Maha Prasat Throne Hall. The procession is made of 77 mounted soldiers divided in two groups. The lead group comprises 44 officers including a section of six buglers, one commanding officer, and four officers carrying the unit's colours. They are followed by the second group of 33 cavalry officers. 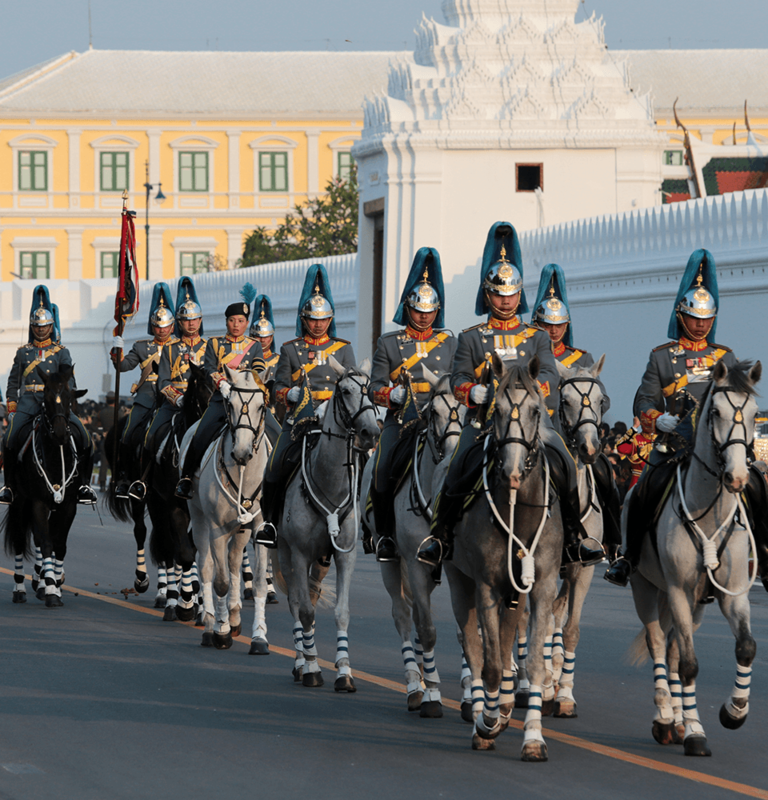 The cavalry unit conveys a royal limousine carrying the royal ashes container from Phra Si Rattana Chedi in Wat Phra Si Rattana Satsadaram via Viset Chaisri Gate to Wat Rachabopit and Wat Bowonniwet Vihara. 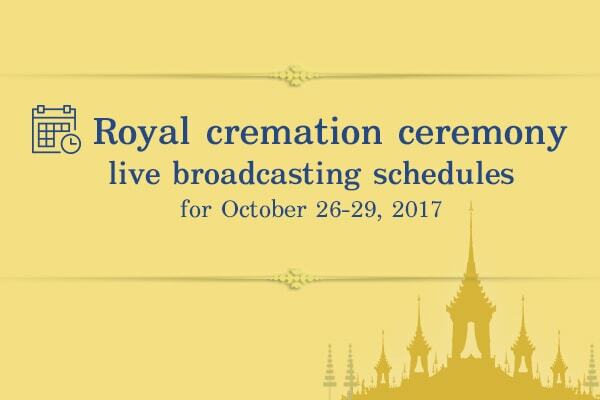 5.30pm: Royal merit making will be performed for the royal funeral of the late King at Dusit Maha Prasat Throne Hall in the Grand Palace. 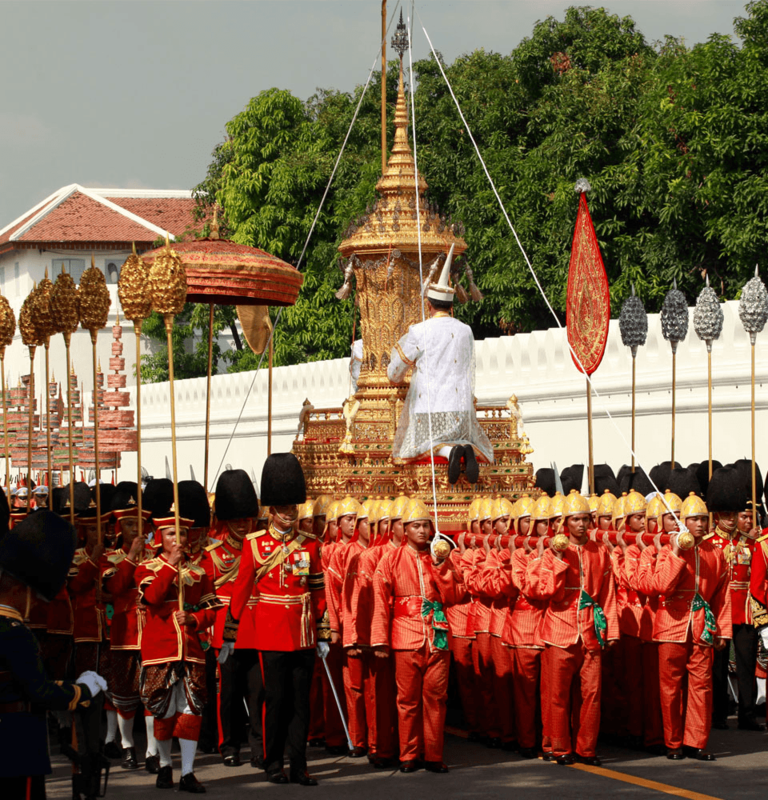 7am:The royal urn will be taken from Dusit Dusit Maha Prasat Throne Hall to Wat Phra Chetuphon Wimol Mangkhalaram, where it will be carried to a chariot. 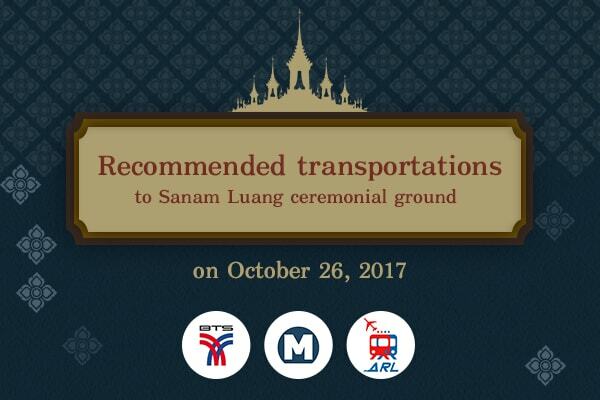 A royal palanquin in a cortege will then proceed to the royal crematorium at Sanam Luang. 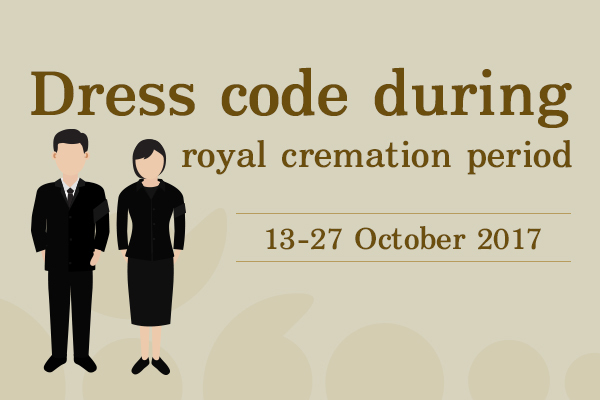 5.30pm – 10.00pm:The royal cremation ceremony will take place. 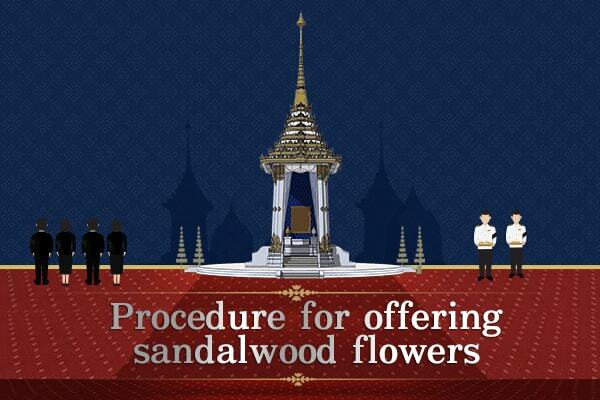 8am: A ceremony for collecting the royal relics and ashes will be performed. 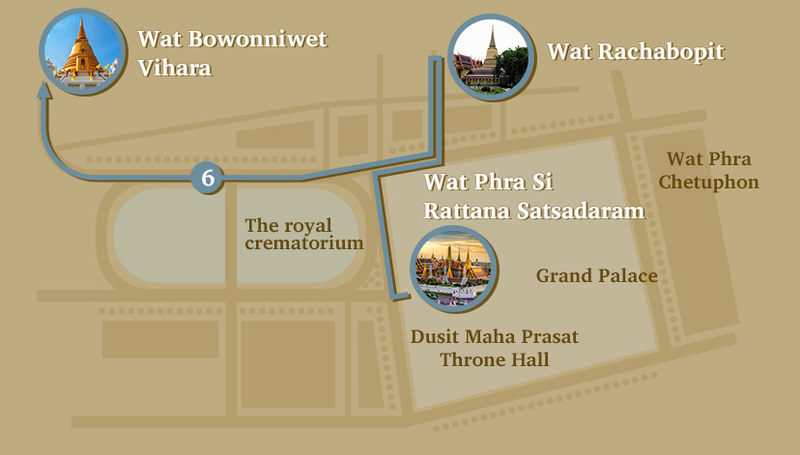 5.30pm:Royal merit making for the royal relics and ashes will take place at Dusit Maha Prasat Throne Hall. 10.30am:A ceremony will be held to enshrine the royal urn containing the royal relics at Chakri Maha Prasat Throne Hall. The hall houses the relics of all late kings in the Chakri Dynasty. 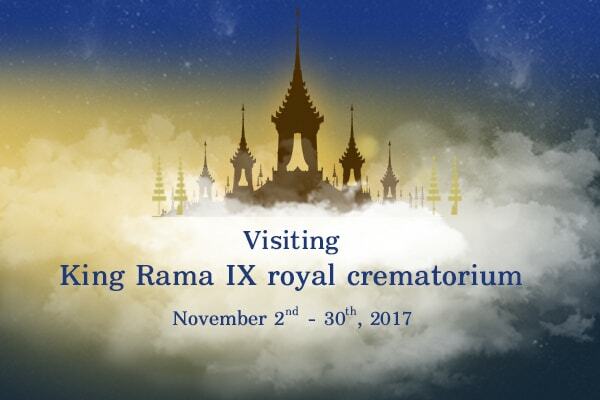 5.30pm: The royal ashes will be carried in a procession that will proceed to Wat Ratchabophit Sathit Maha Simaram and Wat Bowonniwet Vihara, two temples that have come to symbolise King Rama IX. 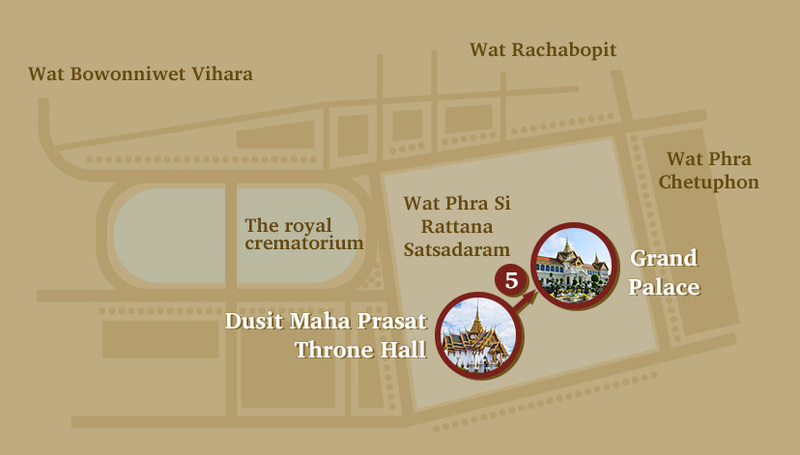 The places where the royal relics and royal ashes of the late King are enshrined. 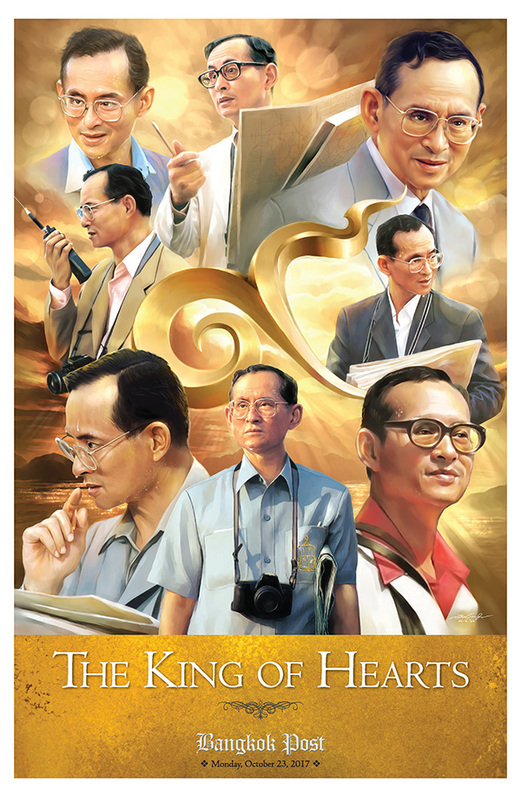 The stories of people and places concerning King Bhumibol.